Just to add a little more info on the blower I "won" on eBay. The gentleman I purchased the blower from tells me that it was on a Knucklehead drag bike named "The Gorilla" owned by Don Jones of California. I understand that there are pictures existing of the bike, but whether I will be able to obtain copies of them is still up in the air. That's about all the information I have so far. As it turns out, when it arrived, I found some lettering stamped into the front bearing housing. S.CO.T. and under that the number 101. This is all stamped on a slightly raised "boss" that looks to have held a "serial number" type plate at one time. If there was indeed a plate there at one time, it would have covered these stamped letters. I am guessing that the 101 is a reference to the size of the blower. The little that I know about S.Co.T. blowers is that they were a company that built supercharger kits for various engines in years gone by. I have seen them mounted on high end vintage style hot rods with Flathead Ford V-8s. The initials stand for "Supercharger Company of Turin"
One manifold (carb to blower) is obviously fabricated from steel, and I must say rather ingeniously at that. I doubt that I would have thought to make it out of sheet metal in a rectangular shape instead of struggling to get round tubing bent to fit. 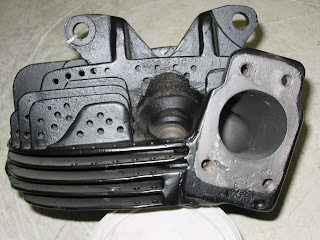 The other manifold is cast aluminum, and though the center to center distance on the ports is in the ballpark for use on a set of dual carb Knuck heads, it likely was built by the supercharger manufacturer as a bolt on kit for a different application. The ports on this manifold are too small to match up with a Knuckle, being approximately 1.060" wide by 1.200" tall. A Knuckle port is round and 1.565" diameter stock. 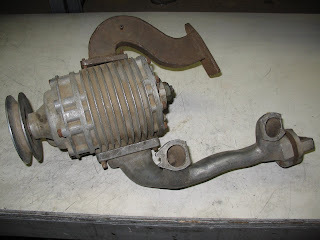 Still, I might have concluded that the manifold was used on a Knuckle despite the size discrepancy were it not for the fact that the flange bolting the manifold to the blower is rectangular which limits the direction the blower could be mounted to facing forward or backward, but not sideways. That means that the pulley on the front of the blower would be at a right angle to crankshaft. Not very likely it would have been mounted in that orientation given the complications to driving the blower it would entail. Another clue, is the fact that the gentleman I bought this blower from tells me that he also has a 2 speed racing transmission from the same dragbike. He told me that the trans case doubled as an oil tank. Very interesting! The size of the blower makes me think that a guy could tuck it in about the same space as a horseshoe oil tank would occupy. That would put the pulley on the blower in the same plane as the engine sprocket, making the drive comparatively simple. It would also explain the "S" shape of the carb to blower manifold. My guess is that there was originally a similarly fabricated manifold going from the blower to the heads. Nostalgia. Nearly everyone is infected with it to a certain degree. Whether it is a passion for the things from their childhood, or just antiques in general, the sense of nostalgia seems to spring from a yearning for the good old days. Those of us who are involved with motorcycles are no different. Now if you take a guy that has been riding motorcycles for 35+ years and drag raced for nearly a third of those years, then I guess it shouldn't be too hard to figure out where his nostalgic urges might lead. Now when I was active in drag racing, beginning in 1986 I raced a Knucklehead. Guess that means that I had a head start on the nostalgia thing, what with heads on my drag bike leaving the factory prior to 1947. Yep, that means I was working with equipment 40 years out of date. This self imposed handicap had way more to do with the "cool factor" and my ongoing love affair with Knuckleheads than any kind of common sense. Still, I was lucky enough to start racing at just the right moment in history to win national championships in '85 and '86 in two different classes. Had I started later, the potential of the Evolution cylinder head would have made it impossible. Earlier and I would have had to compete against an earlier generation that seemed to get amazing results despite the comparative lack of technology. I have been toying with the idea of building a nostalgia Knucklehead drag bike for quite a few years now. Something to mimic the bikes raced in the '50s or '60s would be just about right. Somehow I managed to hang on to a set of dual carb Knuck heads that appear to have been built "back in the day." The holes drilled in the cooling fins along with the big intake valves and porting work make me think that they have seen some drag strip action sometime in the distant past. 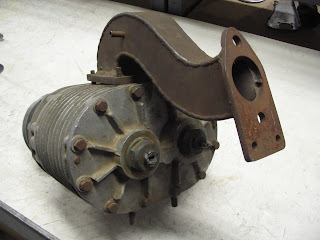 So you can only imagine how intrigued I was a couple weeks back when an auction for an "Antique Harley Knucklehead Blower and Manifold" came up on eBay. From the pictures it looked as though it might even be a S.C.oT. blower. While I am far from an expert on them, I have seen them in magazines on vintage style hot rods. Though the seller said he saw no name on the blower, its age was pretty evident. Still, I likely would have passed on it, had it not been for the fact that I sold a top end on eBay at the same time. Fittingly, what I sold to pay for the blower were the heads, cylinders and pistons from our son Joey's drag bike. We had upgraded to aftermarket heads and big bore cylinders long ago which left these parts in need of a home. I am happy to say that I was successful in "winning" the auction despite several other bids. Best of all, I paid less than what I sold the top end for. Stay tuned for more on the blower, the history I am learning about it, and my tentative plans for it. The measure of faith. Interesting term. If I read this correctly, God deals out, or measures out a specific amount of faith to each person. And by that I mean that each person may not receive the same amount of faith. We tend to look at faith as something that is ours in that it comes from within us. Sometimes this has the potential of being a source of false pride. In fact, if we add Ephesians 2: 9 to verse 8 it reads "For by grace are ye saved through faith; and that not of yourselves: it is the gift of God: not of works, lest any man should boast." It is true. If your faith came from somewhere inside yourself, then you would have something to boast of. But that God gives this gift of faith in differing amounts is a thought that may be even more foreign to many of us but is made quite clear in the Bible. Have you ever noticed how often Jesus used the phrase "Oh ye of little faith"? Often he was speaking to his apostles and he said it many times. Have you ever looked upon another Christian (perhaps a pastor or a missionary) in awe, thinking they have such great faith. That may explain why we tend to assume that faith is something we generate; seeing someone with more faith shows us our own lack. So we blame ourselves. But maybe the truth is we were not dealt the the same measure of faith. So if God deals out the faith to us and he gives each person a differing amount does that mean we are "off the hook" so to speak? After all, if God only gave us so much faith, then isn't it natural for us to only act in accordance with that faith. Maybe.... But on the other hand we also see from scripture that the amount of faith we have is not a constant, unchanging amount. The apostles obviously knew where the faith came from, and who to ask for more. And that it is possible to get more is also shown in scriptures. "Faith that groweth exceedingly". Wow, I want some of that! It is pretty clear that faith is extremely important. 1 Peter 1:3-5 Blessed be the God and Father of our Lord Jesus Christ, which according to his abundant mercy hath begotten us again unto a lively hope by the resurrection of Jesus Christ from the dead, To an inheritance incorruptible, and undefiled, and that fadeth not away, reserved in heaven for you, who are kept by the power of God through faith unto salvation ready to be revealed in the last time. Yes, that makes faith extremely important. Scary important in fact. But there is one more verse that gives me a lot of comfort when I contemplate these things. That means God will not change his mind or take his gifts back. Some Bible versions use the word irrevocable in place of "without repentance". That means that this faith that Romans 12: 3 tells us is a gift, this faith which 1 Peter 1: 5 says God will use to keep you unto salvation, is something he will not change his mind about. Whatever the measure he has dealt you.